TOTALLY rich and wonderful. 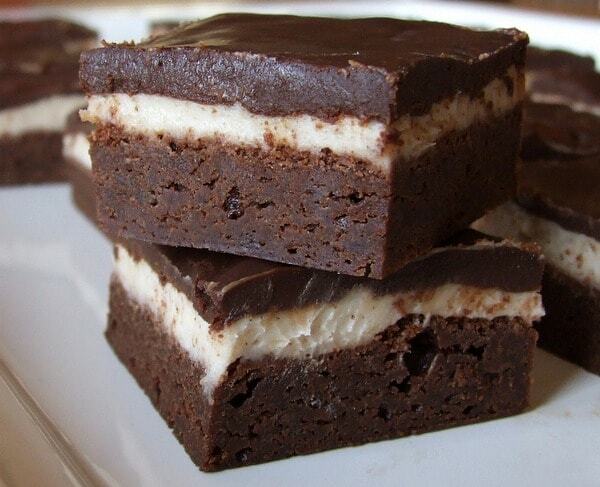 The brownies have basically two layers of frosting- a cream cheese layer and then a glaze. Cut these into small squares for decadent dessert bites! 2. Make the brownie layer: In a large saucepan, melt chocolate and butter with espresso mixture over low heat, stirring, until smooth and remove pan from heat. Cool mixture to lukewarm and whisk in sugar and vanilla. Add eggs, whisking well until mixture is glossy and smooth. Stir in flour and salt until just combined and stir in walnuts (if using). 3. Spread batter evenly in pan and bake in middle of oven 22 to 25 minutes, or until a tester comes out with crumbs adhering to it. Cool brownie layer completely in pan on a rack. 4. Make cream cheese layer: In a bowl with an electric mixer, beat cream cheese and butter until light and fluffy. Add powdered sugar, vanilla and cinnamon and beat until combined well. Spread frosting evenly over brownie layer. Chill brownies 1 hour, or until frosting is firm. 5. 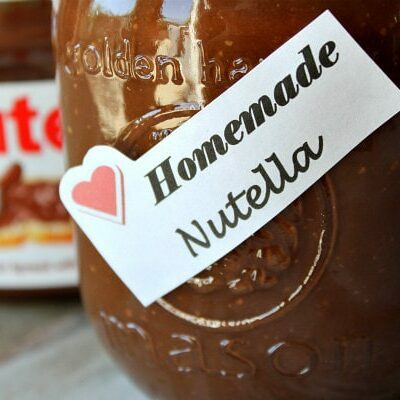 Make glaze: In a large pyrex measuring cup or glass bowl, place chocolate, butter, cream and espresso mixture. Microwave in 30 second intervals, stirring, until melted and smooth. If glaze is steaming hot, let cool a little bit. Pour glaze carefully over cream cheese layer. 6. Chill brownies, covered, until cold (at least 3 hours). 7. If you used parchment, simply lift the brownies out of the pan by holding the sides of the parchment. Place on a cutting board and gently peel off the parchment. 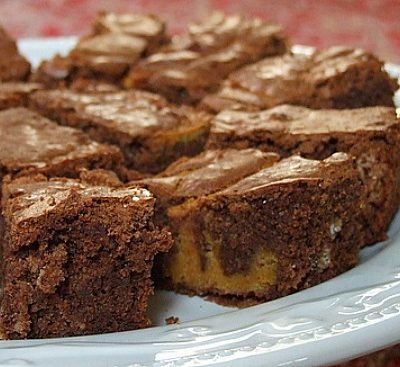 With a long, thin knife, cut chilled brownies into 24 squares. Serve brownies cold or at room temperature. These brownies will keep, covered and chilled, in one layer, for 5 days. 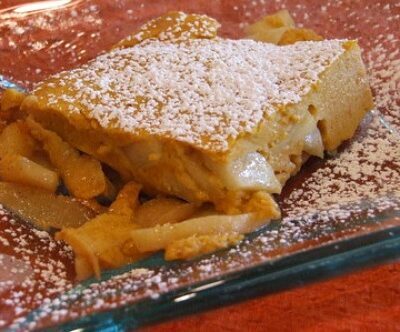 *Use good chocolate- it will make a difference in this recipe. *Be sure to use bittersweet chocolate (not unsweetened). Has anyone tried this with a buttercream frosting and/or have a recipe for some? These look great! What bittersweet chocolate did you use? Any kind is fine– sometimes I just use bittersweet chocolate chips. Is it just 1/2 cup plain flour? Have these been made without the coffee flavor? They look wonderful! I have not made them without the coffee! “1 Tablespoon instant espresso powder, dissolved in 1/2 Tablespoon boiling water.” HELLO? Is this correct or should the 1 Tbsp of espresso be dissolved in 1/2 CUP of boiling water? Please let me know– I’m dying to make these! Thanks so very much! 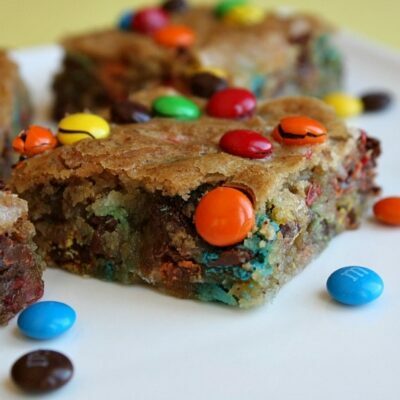 could you make this with a brownie mix? I don’t think so… that would be a totally different recipe. I want to make these! They look delicious! And being a chocolate lover and coffee lover they look perfect! I myself have added coffee to my frosting before and it’s awesome! oh and I too did not have instant espresso powder so I substituted instant coffee granules and it worked out great. Made these and they were delicous :)!!! I especially like the subtle taste of the cinnamon in combination with the coffee flavoured chocolate ganache. For a slightly sweeter ganache I would reccomend adding a tablespoon or so of confectioners sugar. 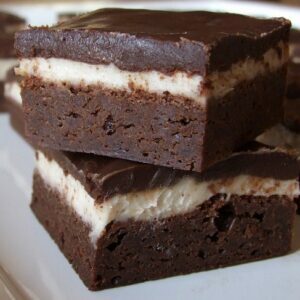 Hi, I would love to make these brownies but I cannot find espresso powder anywhere! Is there a “homemade” recipe for espresso powder? I suppose you could just add in instant coffee instead… or leave it out entirely. I don’t have any idea how you’d go about making your own granules!